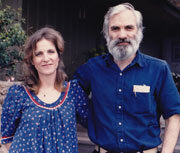 Stefan and Nancy, husband and wife, are the founders of The Laughing Cat, the parent corporation of The Zoo Fence website. For more about that, please click here. Nancy (sometimes known as Anna on The Zoo Fence’s Open Forum) holds degrees from Skidmore College and the British Institute of Homeopathy. Stefan is a graduate of Hamilton College and Columbia University; he began a course of studies at the Bangor (Maine) Theological Seminary, which he chose not to complete. Before undertaking their spiritual journey, both Stefan and Nancy lived and worked successfully in the main stream. He was an officer in the US Navy and the diplomatic service. Nancy, besides serving as the wife of a diplomat (a job in itself), held administrative positions in various institutions, academic and governmental. 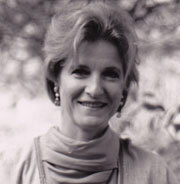 In addition, throughout her life, Nancy has pursued a continuing interest as a professional artist. In 1974, they “left the world”, and built a house themselves at the end of a very rural road in the woods. Here, they consider themselves to be contemplative monks, and they live accordingly. Some of their story is told here and there at The Gazebo, and on TZF’s Open Forum, particularly at Nancy’s Blog, and as “true fiction” in The Cranberry Tales and A Continuing Fiction. Stefan is the creator, editor, and webmaster of The Zoo Fence, and, except where specifically indicated otherwise, the author of everything on the website. Thus, his work may be found throughout the site, but particularly at Consider This!, Letters, Brother Theophyle, The Gazebo, Definitions, The Sacred Riddle, Editor’s Desktop, Miscellanea, and Books & Stuff. Nancy is the author of Nancy’s Page and of much of the writing at Integral Health; in addition, she is the creator of many of the paintings and etchings on The Zoo Fence (please see TZF’s Art Gallery and her own art website). Both were frequent contributors to The Zoo Fence’s Open Forum, which is now accessible in read-only form. There her username is Anna, his is ZooFence and Speculum. Visitors interested in some of the specifics of Stefan’s and Nancy’s spiritual journey may wish to read “Nancy's Blog” here. 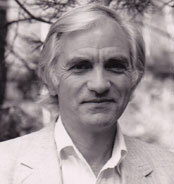 Although no longer doing so, for several decades Stefan lectured extensively across the United States on his experience as a seeker of truth and as a homesteader.